Recipe 58: This recipe doesn’t need a translation…you just need to call it like this! It’s a must of the roman tradition and if you go in Rome, you will see this pasta in the most of the restaurants. With the carbonara and the amatriciana this is another classic! 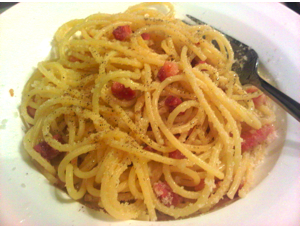 Ingredients 2 people: 200gr spaghetti, 100gr pancetta (but if you find the guanciale is better), 50 gr Pecorino (absolutely use just pecorino), some salt, balck pepper and a just a little bit of milk. Also this recipe it’s really quick and easy. It’s basically a carbonara without eggs and all the taste comes from the amazing fresh ingredients. You don’t need to be a chef to make a good one! Put some water to boil with salt and in the meantime cut the pancetta in very thin slices or pieces. When the water boils, add the spaghetti and place the pancetta to cook in a hot pan without any oil or butter. The pancetta is already quite greasy so it won’t need any other thing to cook. When the spaghetti are cooked “al dente” (so one minute before the real time), drain them and add them to the pan with the pancetta. In the meantime in a bowl add just a little bit of milk to half of the pecorino and mix in a way to create almost a cream. Add this to the pasta and the pancetta and mix until the pecorino melts totally! the secret of this pasta is all here!!! Now just serve it in a plate with some other pecorino on top and a good quantity of freshly grated black papper! Yummy! PS. Mamy come poteva mancare sul mio blog una bella Gricia! Veramente l’apoteosi! Sto tentando di svuotare il frigo prima della partenza e avevo proprio questi 100gr di pancetta e ancora un po’ di pecorino e visto che era pure domenica, ho pensato che un bel piatto di pasta ci stava tutto! Che te ne pare?